Thousands of people have marched from the Creggan to the Bogside in the annual Bloody Sunday commemoration march in Derry/Londonderry. Figures dressed in paramilitary uniform are among those who have taken part in the march, marking the 47th anniversary since the shootings. Thirteen unarmed civilians were shot dead by Paratroopers on Bloody Sunday during a Civil Rights demonstration. Fourteen others were wounded, including one man who later died of his injuries. The PPS then informed the police there were grounds for prosecution and a full inquiry should follow. 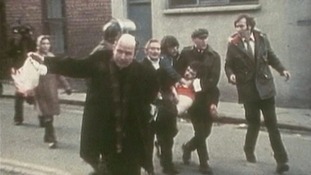 The inquiry into Bloody Sunday unequivocally blamed the Army for the catastrophic events of January 30 1972. The Saville Inquiry cost £195 million and was the longest-running and most expensive in British history. Earlier this week, it emerged one of those soldiers has passed away. An evidence file on soldier N, a lieutenant in the Parachute Regiment at the time of the shootings, had been under consideration by prosecutors in Northern Ireland, with a decision on whether to pursue a criminal case due next month. Decisions on the other 17 soldiers - and two former members of the Official IRA who were also involved in Bloody Sunday - are still expected in late February. The sister of one victim, Kate Nash, said she was "disappointed". "Obviously we are very disappointed because we want to see these soldiers in court," she said. Her brother Willam Nash was 19 when he was shot dead at a rubble barricade on Rossville Street. Ms Nash warned against any unnecessary delays in pursuing the rest of the cases. She added, "Let's get things started and get things going, we have waited 47 years so it would be good to finally put this to rest."